Today's featured stamper on Split Coast is Mrs. Boz - she has a lot of pretty stuff in her gallery so it wasn't hard at all to find something I wanted to CASE today. I chose her pretty fall flowers card . The circle design and images along the edge appealed to me. I replaced her flowers with these cute little gingerbread men and candies from the Oven Fresh set by Waltzingmouse Stamps . The word Christmas is from the Half Baked set. I added a ribbon and dew drops and sponged the edges of the circle with Chai Ink from PTI. I've been wanting to use this fun peppermint candy DP from Cosmo Cricket and it seemed to fit here perfectly! Using the Gingerbread men and candies qualifies my card for Thursday's Ways to use It Challenge -to use sweets! I suddenly feel like I need to go bake some cookies?!?! 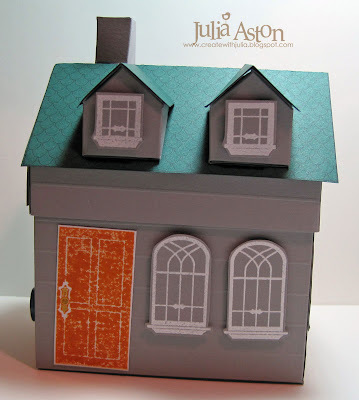 I used the Home Made Template from PTI for my cute house as well as the Home Made stamp set for the windows and doors. The colors are those of my BIL's house as I will be giving this to them as a thank you for having us over for Thanksgiving this year. The house is about 4.5 x 3.5 x 5.5 and the roof comes off so you can put cookies, candies, candles or any treat inside. I included home made spiced nuts in mine! Here's a view of the side and back of the house. I put this bicycle here because SIL Carol has her childhood bike (that looks very similar to this stamped one) on her front porch decorated with flowers in it's basket. I made the Thanksgiving 2009 label with my label maker to remind them of when they received it - and below you can see the other side of the house with it's windows. It's good to be back to stamping after a few days off for the holidays! I'm also glad all the "eating till you're completely stuffed" is over with! I appreciate your stopping by today! Phew - hope you can follow all that! I think Joanne (sleepyinseattle) wanted us to make a wreath using stamps for the DDC - and I used foam flowers but the ring under it is a stamp! (Note: I got the flowers from Taylored Expressions but I don't see them on the site anymore.) The pretty frame here is from the Labels No 1 set by Waltzingmouse Stamps and the sentiment is from the set called Blessed by You. The stamped label fits nicely inside the Labels One Nestability die so it's a breeze to cut it out whoo hoo!! I wish you all a Blessed Thanksgiving! 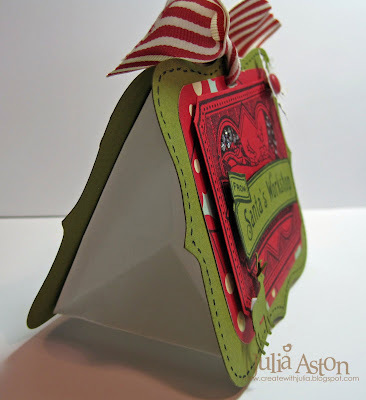 I just had to play along with the Try a New Technique challenge over on Split Coast - the challenge was to use Claire's wonderful Stocking Gift card Holder template . You can see all the stockings in the SCS gallery here. I ran faux stitches around the top, toe and heel using a brown Copic. The stamps are Waltzingmouse Very Vintage Labels No 4 and the sentiment is from the secret set. 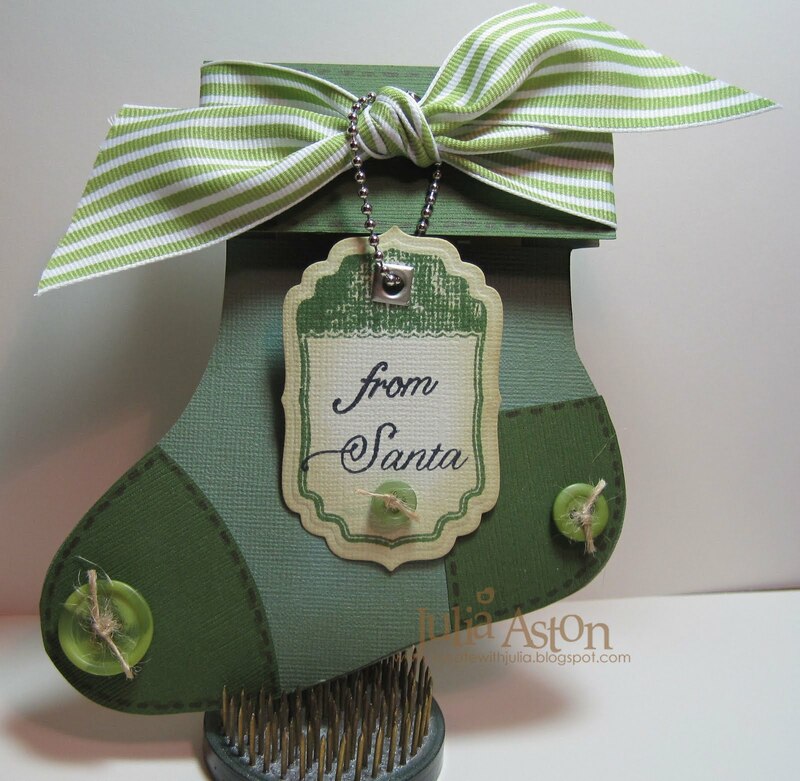 The wonderful ribbon is from Sharon's No Time to Stamp Ribbon Shop. I hung the tag around the ribbon with a chain from Michaels. I sponged around all the edges with chai ink - which qualifies this for the CAS challenge to use sponging. I kept the embellishments simple in the clean and simple tradition. This may be my last post for a bit - got lots going on for a few days - I wish you all a wonderful Thanksgiving time - I hope you are sharing this time with some loved ones - but regardless of who we are with - we need to remember to count all our wonderful blessings and thank God for them! I'll be back soon with some pics of my adventures. 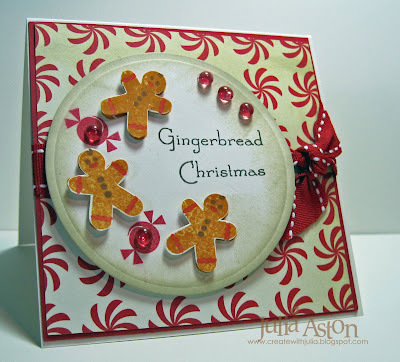 Birgit (Biggan), the featured stamper on Split Coast today often uses textured cardstock on her creations. I love how it gives the simplest of cards added depth. She has absolutely gorgeous cards in her SCS gallery. I chose this fun apple card to CASE today - because I loved the framed panels of the card stock and the simplicity of the images. I used a different image and sentiment, left off the ant (!) and placed the gems in different places - but basically it's all Birgit's wonderful design! My apple and sentiment are from the Peace and Plenty stamp set by Waltzingmouse Stamps . I stamped the apple on red Bazzill paper, cut it out and layered it on the card with foam dimensionals. Then I stamped the leaf on green Bazzill paper, cut it out and adhered it over the red stamping. I colored the stem with a brown Copic. I inked the edges of the apple with Chai Ink to give a little dimension to it. I drew the line around the inside panel with a Micron pen. Another weekend come and gone - back to work tomorrow but at least it's a short one with Thanksgiving on Thursday! 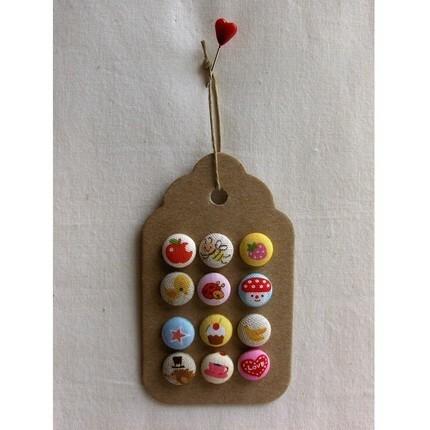 Today's Inspiration Challenge on Split Coast was a web site of covered buttons called Aimoobaroo. What fun buttons she has!!! 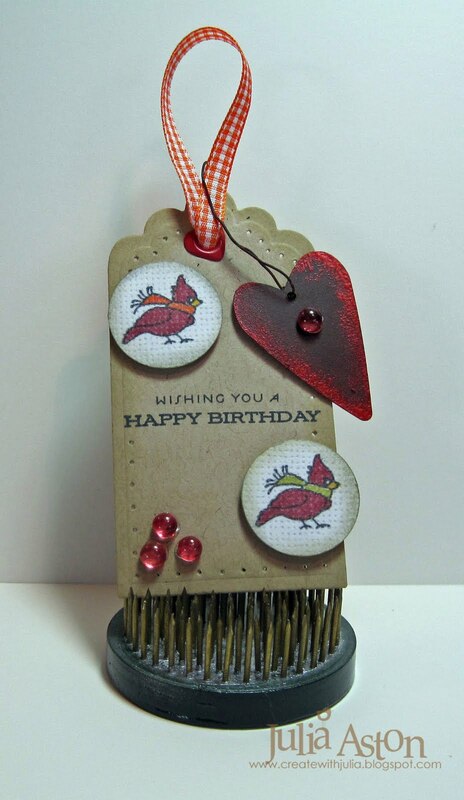 I was inspired by the tag set above and created this birthday card tag. I wanted to use this cute cardinal stamp because this b'day card is being sent to my stamping friend Anne's mum and she loves cardinals! The tag is a Spellbinders die. 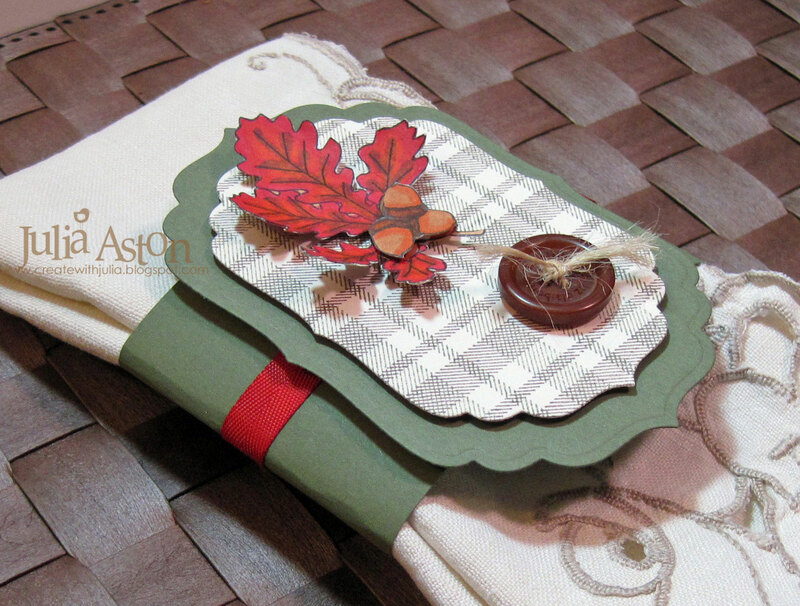 I used linen vellum card stock from Papertry Ink for the 'buttons' as I thought it mimicked the look of the cloth. The birds are colored with copics. This also fits last Tuesday's Teapot challenge to use a cardinal on your card. Thanks so much for stopping by today! 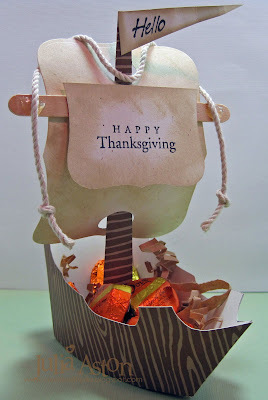 I have to pop this card in the mail quick as Evelyn's b'day is Thanksgiving day and I want to be sure it arrives in time! 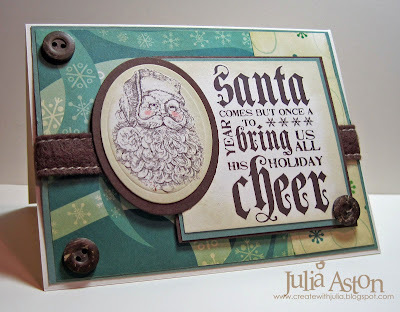 Here's my tall card for the Limited Supplies challenge over on Split Coast. I made my card 8x4. I used two different snow theme designer papers and this cute stitched snowman from the Sewing Box Christmas Set by Waltzingmouse Stamps . I stamped snowflakes from the set and punched them out with a circle punch then stamped the words over them. (not sure if you can see the green snowflakes on the green paper in the pic but you can IRL! click on the picture to see it a little bigger) I highlighted the snowflakes with some dots using a white gel pen. 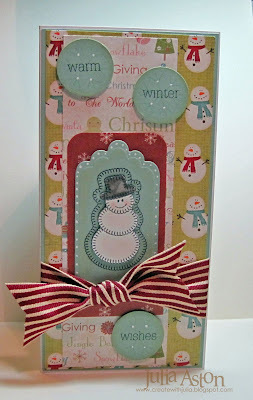 I stamped the snowman on a Spellbinders tag - then stamped him on white. I cut out the snowman on the inside line and layered over the tag with foam dimensionals. I colored him with Copics. The great ribbon is from Sharon's No Time to Stamp Ribbon Shop. I also used this weeks Split Coast sketch for my card. It was fun making a different size card for a change but I will have to make a special envelope to fit it! 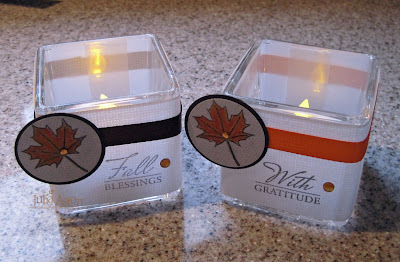 I decorated these pretty square glass votive holders (AC Moore - just $2.19!) for my Ways To Use It Project today - the challenge topic on Split Coast was Giving Thanks. I wrapped a 10x2 panel of this lovely linen vellum cardstock around the votive. You can see that the light from the candle shines nicely through it. I stampd the sentiments and leaf from Peace and Plenty by Waltzingmouse Stamps right on the vellum with Timber Brown Stazon Ink. I colored the leaf with copics, punched it and layered it on brown cardstock. I wrapped twill around the top and layered the leaf circles over it. Then I just added two gems for a little glitter. I think these will look SO pretty on a table for Thanksgiving don't you?! 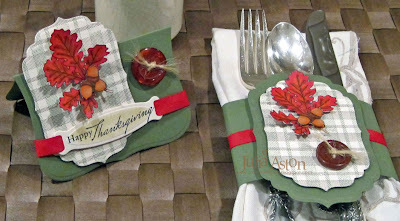 I made my Thanksgiving Table decorations for two Split Coast challenges today - The Color Challenge (always artichoke, real red, chocolate chip and a neutral) and the Doubledog Dare Challenge I do with some friends where this weeks hostess Anne Harada (Itsapassion) challenged us to use plaid and a button on our card/project! Of course I immediately thought of my Waltzingmouse plaid stamp from Off Beat Backgrounds. I stamped it with artichoke and chocolate chip. The base is cut with Labels Eight Nestability and the plaid panel is cut with Labels Four. This would make a pretty place card by adding the name of your guests or it would look nice just as it is on the table! I also made a napkin ring using the same design. I just added a strip of card stock to wrap around the napkin. 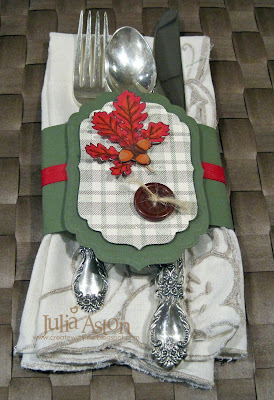 I always get out the nice linen napkins inherited from my aunt and mother and pretty sterling silver for Thanksgiving and Christmas! I colored the leaf stamp from Peace & Plenty with Copics, did some fussy cutting and layered it onto the plaid panel with foam dimensionals after curling the leaves on my fingers a bit. I tied some twine through the buttons and frayed the ends for more dimension. I promised to share with you the projects I taught at my class at the Paper Tree this weekend. 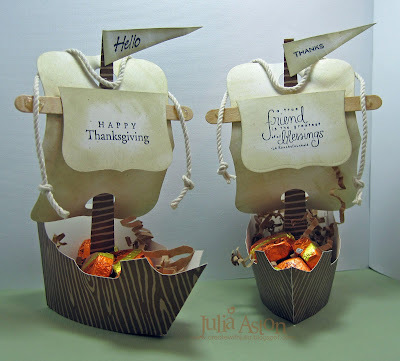 We made this great Mayflower ship and two clean and simple Thanksgiving cards. The sail is made using the Labels Eight Nestabilities. I inked all over them with a Chai ink cube. The paper for the ships is woodgrain by Amuse. The template for this super ship was made by Qbee and can be found on Split Coast here. 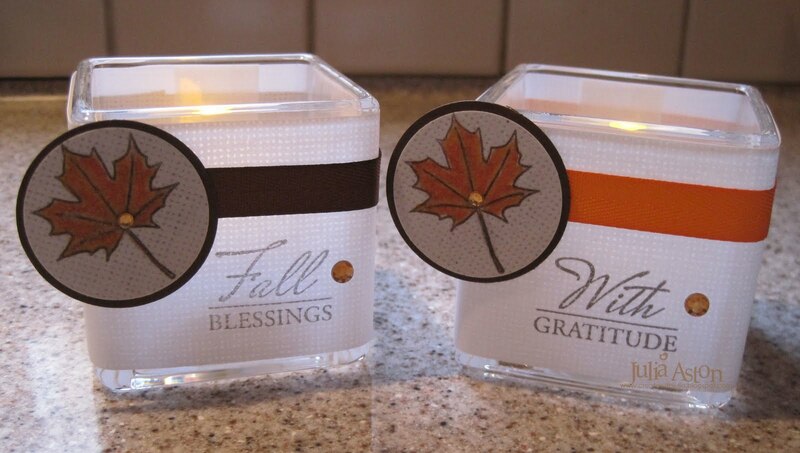 It's the perfect size to place at each guests seat at your Thanksgiving table filled with nuts or candys. Last year I made some and stamped everyone's name on the sail as place markers. 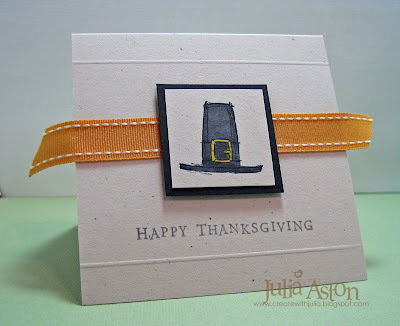 This fun pilgrim hat is by Inkadinkado (may be retired) and the sentiment is by Hero Arts. I colored both images with Copics. I love how cute these are! And they go together really easily - I'm making them for everyone this year! Next up is my card for the challenge on Split Coast today. Dawn (treasureoiler) was the featured stamper . I needed to make a b'day card for my 4 year old God-Daughter, Eden and I knew I'd find a wonderful card to CASE because Dawn uses lots of cute little girl stamps on her cards! Sure enough I found this adorable card to CASE. I changed the image, the colors and added a lacey punched edge as well as the number 4. Eden loves Strawberry Shortcake - so I found an image on line and printed it on card stock. I colored it with Copics and framed it with circle Nestabilities. I added a couple of gemstones for a touch of glitter! I'll be giving her this tomorrow night along with a few gifts - we're getting together for a little tea party! This is the Taylored Expressions sketch for this week. And here is my card using the sketch. The Limited Supplies challenge on Split Coast this week was to make a thankful type card and to use a bird on it (kind of a weird twist huh?!) and we could use a turkey if we wanted! I decided to use this lovely shaped bird from the Celtic Heritage set by Waltzingmouse. I thought it looked a little like a partridge and would work on a fall card. I used the same colors to color the bird as I used on the wreath. The wreath and sentiment are from the Peace and Plenty set. Two of my panels are stamped with background stamps - the grid and dots are from the Off Beat Background set. The larger panel is designer paper from Papertrey Ink. I popped up the body of the bird inside the wreath and then layered the head over the body to give more dimension to it. I added some gems to the wreath and sentiment for a little shimmer. The images are colored with Copics. 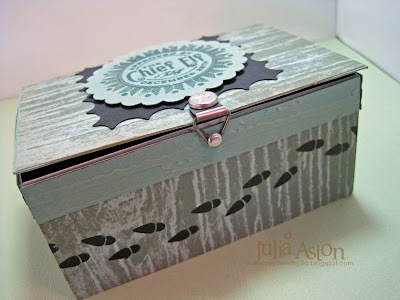 I'm off to teach a class Saturday morning up at The Paper Tree in Manchester, NH my favorite stamping shop! - I'll show you what we made later this weekend so be sure to come by again! Did You Lose Your Mittens??? 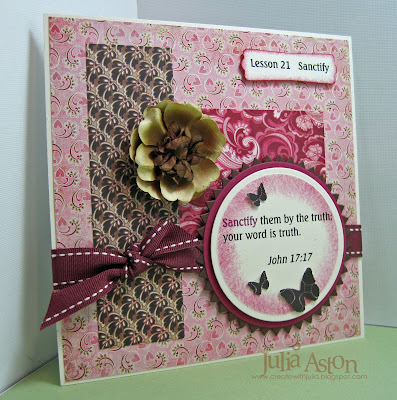 I made this card for the Ways to Use it challenge on Split Coast which was - faux textures. For my textures I embossed in white, layered the mittens, had faux stitches (stamped on the mittens!) and I paper pierced around the edge. I appreciate your coming by today! Hope you haven't lost YOUR mittens! Winter's coming! Today the Teaparty is traveling all the way to Michigan to save little Dusty Bear from the attic and give him a new home with all his new Teaparty friends. Check out the full story here. I'm bringing little bear Deidre who is hoping she can stay there with Dusty. She thought to bring along a few extra buttons in case Dusty needs to replace any eyes or some such thing?! The Doubledog Dare Challenge on Split Coast this week from hostess Charlene was to make a card for the Teapot Tuesday challenge - so here we are - one card - two challenges! Come along and play with us! Put DDC in the keyword when you upload to SCS. Today's CAS (Clean and Simple) challenge on Split Coast was to make a card using white and only one color. The only embelishment I used was two scored lines above and below the damask and the sentiment. 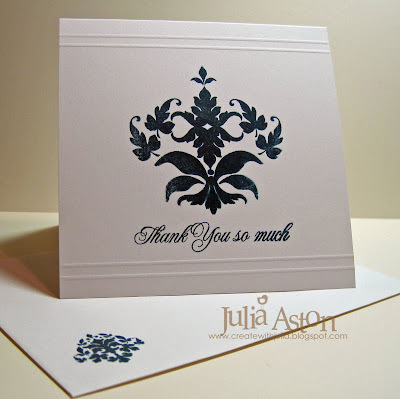 I also stamped a smaller damask on the envelope for a little extra fun! I was away for most of the day Sunday but my stamping friend Christine (chrisations.ink) was the featured stamper over on Split Coast- so I just had to CASE one of her cards. I chose this pretty card. 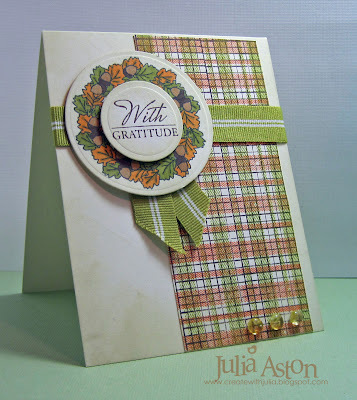 I liked the plaid designer paper she used and wanted to use my Off Beat Background set by Waltzingmouse Stamps to make my own stamped plaid DP. 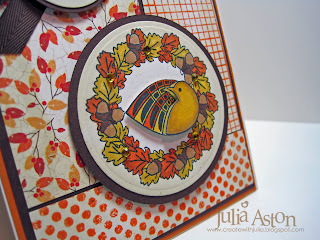 The beautiful fall wreath and sentiment are from the Peace and Plenty set. I used Circle Nestabilities to cut them layering the sentiment over the wreath after sponging the edges with chamomile ink. I used different stamps and colors than Christine and placed the sentiment inside the wreath rather than on a separate panel. A friend of mine at work commissioned me to make 10 thank you cards - so this will be one of them. I think he'll like it. 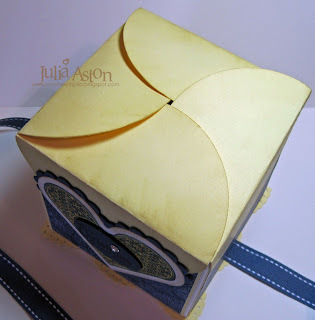 Don't you just love this petal top box? I found it here And I've been wanting to make one ever since I found it. Today's Inspiration Challenge on Split Coast gave me the opportunity. 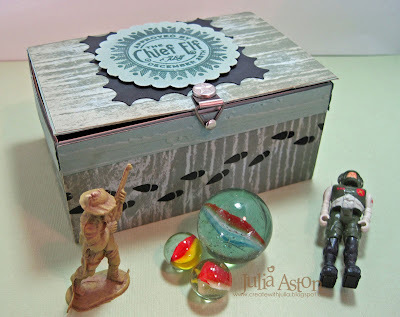 I was inspired by this box on the web site Stef showed us. (sorry the site wouldn't let me copy the picture so I had to just link it!) I used these non-traditional colors to go along with the inspiration piece. 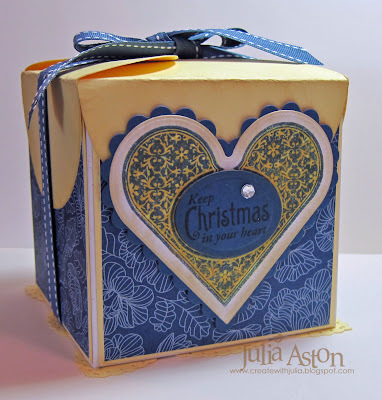 The lovely heart and sentiment are from the Waltzingmouse set called Seasons of Love. (I think it's out of stock right now but Claire might be keeping a wait list if you want to contact her.) The heart fits one of the Heart Nestabilities but you can also just cut along the edge with scissors of course. I used all Papertrey Ink papers sponging the edges of the heart, the sentiment and the yellow circles with Chai Ink. Here's how the top looks when you close the 'petals'. The box is 4" square (you start with a 12x12 piece of cardstock and score at 4" on each side.) so it's a good size to fit a candle, or a lovely ornament, some soaps or cookies - lots of things! The petals are made by cutting 4" circles, folding them in half and attaching them to the outside of the box. You cut a square for the bottom and punch the edge with some kind of scallop punch. Put the ribbon across the bottom of the box, then attach the square panel over it. 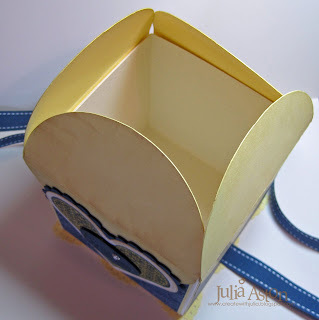 It's a very easy box to make and I think it comes out looking quite impressive - don't you!? The Ways to use It Challenge on Split Coast this week was to use stickers or rub ons on your card. I have several packages of rub ons but I always forget to use them. I found these pretty Christmas ones in my craft room from Stampin Up that I bought last year when they were on sale and knew they'd be just the thing for the challenge! I used the mojomonday sketch for my card. I just touched Santa's cheeks with a blush Copic for a dash of color - I wasn't sure if it would stay on the rub on - but it did! The great papers are Cosmo Cricket Jolly by Golly. This cute baglette is from the big guy himself (Santa that is!) but I'm sure the elves designed and made it for him to givw out! 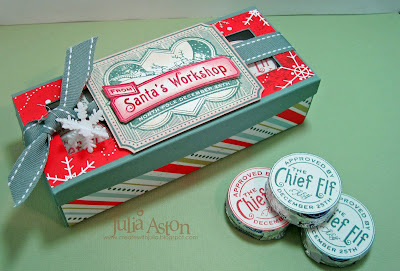 The shape looks surprisingly like the Top Note by Stampin Up and this is the official Santa's workshop seal on the front. How fun that they attached a little reindeer and snowflake on the corners to give the North Pole atmosphere! Inside they tucked more of those fun mints with the Seal of the Chief Elf on them - again - an official mark so we know these are the real thing straight from the North Pole! And on the back - a personal note from Santa (doesn't he have lovely handwriting?!?) for the kids (and parents!) who have left him a little treat to give him strength for his travels Christmas Eve. Santa is nothing if not a gentleman - get a treat, give a treat! Now - you can find very similar stamps to those used on this project by the elves above over at Claire's shop Waltzingmouse Stamps. Check out her other two new sets while you are over there - you'll definately want to pick up one or two! And - just a suggestion - if you like it - buy it - she sells out fast on her lovely stamps! Accessories: foam dimensionals, ribbon - SU, brads, silver Stickles, glue dots, reindeer & snowflake punches - Martha Stewart, Sakura gelly roll black pen, Top Note Die & horizontal slot punch - SU, scalloped circle punch, white paper sack - Michaels. In continuation of my post yesterday - I have full size pictures of the fun treasure treat box Santa's Elves created to be left for good girls and boys on Christmas Eve! 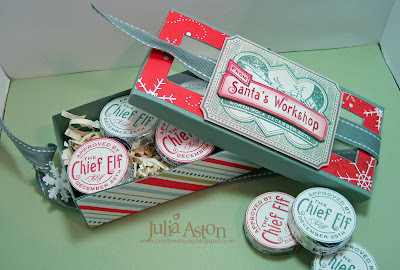 The Elves were gracious enough to send me all the details on how they created this cute little box! Then they added their 'boot' stamp of approval inside the box as an added point of authentication! You can never be too careful about these things I guess - they don't want anyone copying them! You can find stamps very similar to the ones that the elves used here at Waltzingmouse Stamps It's listed as a secret set and you need to get the password on Claire's blog in order to see it - how very mysterious - but of course very important when you are dealing with the work of Elves! Certain secrets must be protected! 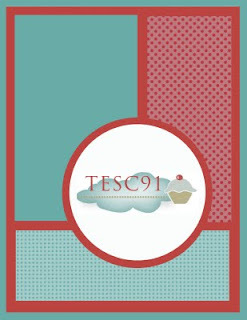 And here's a little clean and simple card - made by me! 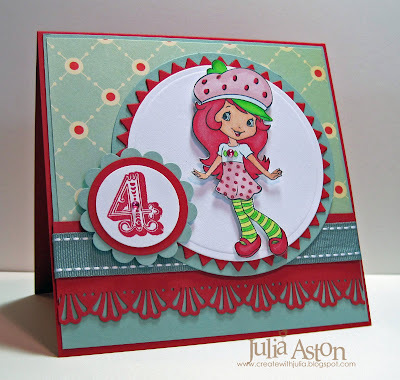 It was made for the Color Challenge over on Split Coast this week - to use neutrals and then stamp with color for POP! 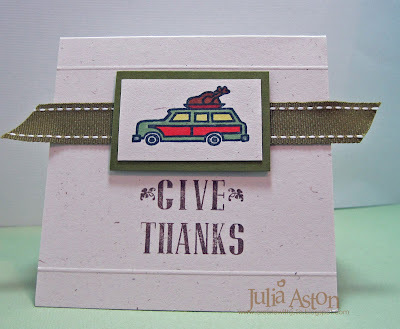 It is also for this week's Doubledog Dare Challenge from Francie G to use at least 4 layers and a ribbon on your card. 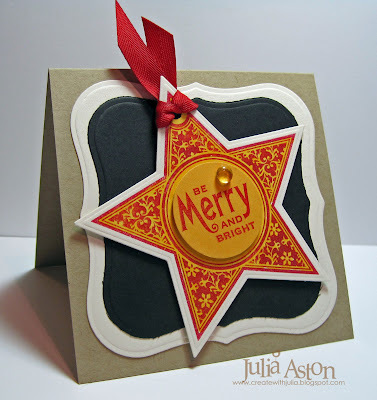 This wonderful star is from the Seasons of Love set by Waltzingmouse Stamps I stamped it in red then colored it with an orange copic. I stamped the sentiment on Summer Sunrise card stock, punched it with a circle punch and layered it over the center of the star with foam dimensionals. I just love how this came out! See you tomorrow when I'll reveal the 3rd Project from the Elves - the little baglet shown on my Monday post! 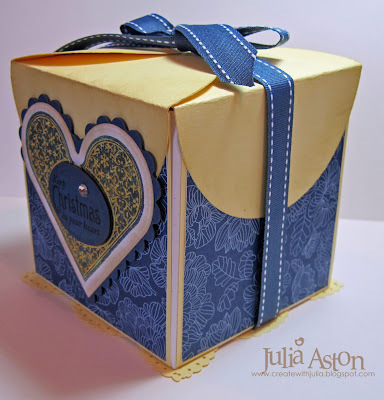 The wonderful box pattern was found on this blog. (Who knew that the Elves surfed the web for ideas just like us!!??!) 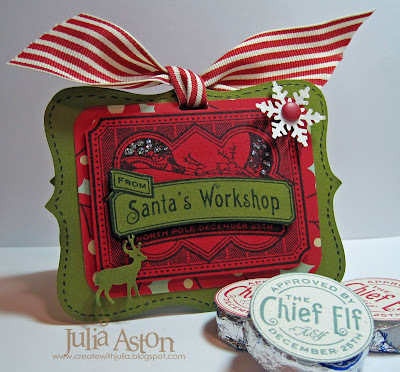 They added their official Santa's Workshop label to the cover of course and used some lovely Christmas papers to decorate it. 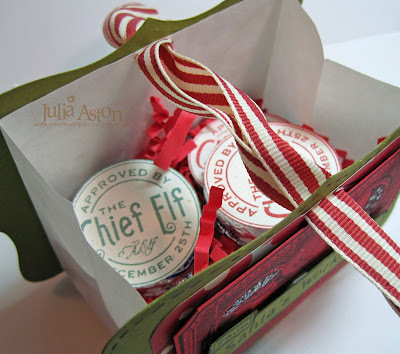 And tucked inside are some wonderful mints topped with the Chief Elf's stamp of approval. Wouldn't you love to find this inside your stocking on Christmas Morning?!? 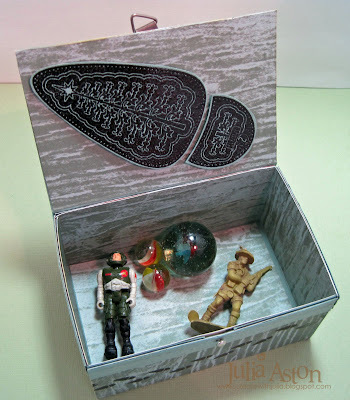 Tomorrow I'll be posting the elves instructions for the special treasure box I showed a snippet of on yesterday's post so be sure to drop by! Santa's elves just dropped off these fun treat boxes to my house! They are some new designs the elves are trying out - to leave little thank you treats for good boys and girls on Christmas Eve! I'm just showing little snippets of the containers today - but the full views may be showing up here shortly! 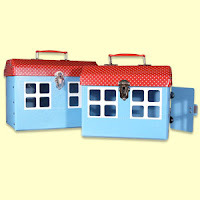 Here is a wonderful little trunk - just right for storing all those 'little treasures' kids have. I guess the elves walked all over the sides with their tiny feet covered in coal?! 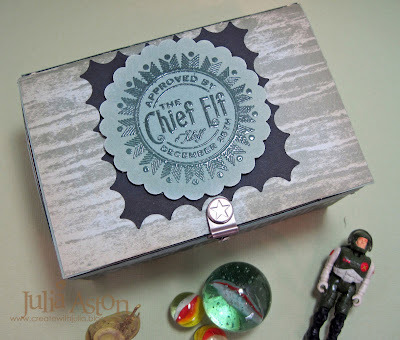 And this lovely box holds mints - approved by the Chief Elf himself! This little baglet is a thank you from Santa for leaving him cookies - I wonder what he put inside this???? You might want to check out Claire's blog and the Waltzingmouse store to see her newly released sets (they'll be available later today!) . You'll need to pick up the password on Claire's last two postings in order to get in to see the secret set that the elves used to make the projects above!!! You could win the set just by leaving her a comment in the secret posting - Whoo Hoo!! Does this get you in the spirit!?!?! What do you think of the elves new ideas??? They asked me to report back to them! I'm finally caught up with my biweekly His Holy Name pages! Somehow the weeks had come and gone and I was suddenly 3 challenges behind! 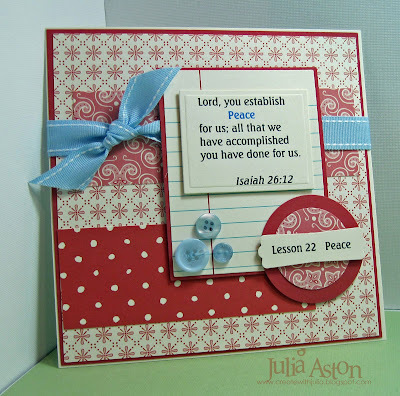 This 6x6 page is for Week 22 and God's attribute of Peace. I chose Isaiah 26:12 to illustrate this attribute. I used all Amuse designer papers on this page. The ribbon and buttons are Papertrey Ink. And here is my 6x6 page for Week 21 of the His Holy Name Challenges. God's attribute for this week was Sanctifies. I chose this verse from John 17:17 to illustrate this attribute. I used the MojoMonday sketch for my page. The papers are all Basic Grey Bittersweet.You can find the His Holy Name Challenges here in the forums on Split Coast.